NAPLES, FL (October 27, 2017) – Gulfshore Insurance announced it has been named a Blue Zones Project Approved™ Worksite by Blue Zones Project® – Southwest Florida, a designation indicative of its commitment to helping Southwest Florida residents achieve even healthier lifestyles. 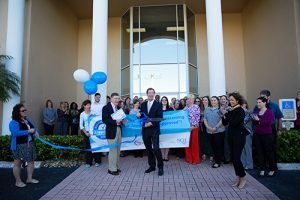 A ribbon-cutting ceremony celebrating the designation was held October 26, where the agency joined more than fifty companies in the area that have made the movement towards healthier choices. Before we know it, the summer months will be in full swing. Remember, those who work outdoors are at a much higher risk for heat exhaustion, dehydration, sunburn, skin cancer and more. Skin cancer affects more than two million people every year and invasive melanoma, the most dangerous type of skin cancer, will kill more than 10,000 Americans this year, according to the Centers for Disease Control and Prevention. That is one death every 52 minutes. As an employer, are you doing enough for your crew? Rotate workers on a job site in and out of non-shaded areas, especially during the height of hazardous UV rays from 10 a.m. to 4 p.m. Eastern Daylight Time (9 a.m. to 3 p.m. Central Daylight Time). Consider including heat safety and skin cancer education in your regular safety training. Educate employees on the early signs of heat exhaustion, dehydration and skin cancer. Encourage employees to look out for each other to detect wooziness, inability to focus, unsteadiness and reddening of the skin. Use and make sunscreen readily available to your employees as well as other PPE, like UV-resistant sunglasses, wide-brimmed hats and re-fillable water containers. Create mandatory water breaks to re-hydrate the crew and provide them with plenty of water. Create and enforce policies about heat safety so employees know the company is serious about safety. 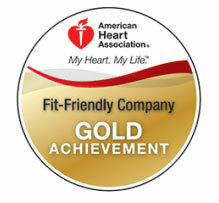 Gulfshore Insurance has been recognized by the American Heart Association (AHA) as a Gold Level Start! Fit-Friendly Company for the sixth year in a row. Through the Start! Fit-Friendly worksite program, AHA recognizes employers who go the extra mile for their employees’ health. At Gulfshore Insurance, all employees have access to a wellness coach, employee walking groups, healthy food options in the lunch room, and health-awareness seminars. “We’re committed to creating a culture of health in the workplace. Thanks to these initiatives, more Gulfshore Insurance employees are reporting increased physical activity, less stress, and improved health. In addition, employees today are more knowledgeable about their own health than ever before,” said Michelle Gleeson, Vice President and COO. The American Heart Association’s Start! Fit-Friendly Companies program is a catalyst for positive change in the workplace. Employers throughout the nation can be part of the Start! initiative by demonstrating progressive leadership by making the health and wellness of their employees a priority. With the holidays quickly approaching it is important to be sensitive to all employees’ cultural and religious beliefs. Many employees will decorate their office spaces with trinkets and ornaments revealing their religious beliefs during the holidays. With employee claims of religious discrimination on the rise in the U.S. and workers’ expressions of faith growing more diverse, companies are dealing with the complexities of managing religion on the job. Religious discrimination is a serious matter, according to the Equal Employment Opportunity Commission religion-based complaints have more than doubled in the past 15 years, and are growing at an even faster pace. While the act is non-physical, religious discrimination can cause serious emotional harm.